Mother’s Day, birthday, or just any day at all... this rose-scented 7.3 oz. 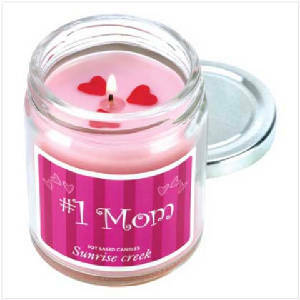 candle is a charming way to warm Mom’s heart! Long-burning soy candle provides hours of delightful fragrance.45 hours burn time. Lead free wick. Made in USA. Weight 0.8 lb. Soy blend wax with glass lidded jar. 2 3/4" diameter x 3 1/2" high. Delight even the most daunting diva with this glamorously perfumed candle! No femme fatale will be able to resist this seductive blend of lush floral scents. Scrumptious! Burns up to 50 hours. Weight 2.2 lbs. Soy blend wax with glass jar. 3 1/2" diameter x 4 3/4" high. Give any girl the royal treatment with this opulently scented jar candle! Simply set the wick alight and the air comes alive with a spicy, exotic floral perfume. Burns up to 50 hours.